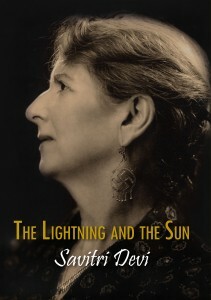 The Lightning and the Sun is Savitri Devi’s magnum opus and one of the founding texts of post-World War II National Socialism. Written in Europe from 1948 to 1956 and published in India in 1958, The Lightning and the Sun sets forth a unique and stunning synthesis of National Socialism with the cyclical Traditionalist philosophy of history and Hindu mythology. In the first part of The Lightning and the Sun, Savitri Devi sets forth the Traditionalist view that history is cyclical and declines from a primordial Golden Age through Silver and Bronze Ages to a final Dark Age, or Kali Yuga, after which a new Golden Age will dawn. Savitri Devi then offers an original distinction between three kinds of men in relation to the downward course of time: Men in Time, who push historical decline forward; Men above Time, who seek to rise entirely above historical decay; and Men against Time, who fight the downward current to time. Men in Time are likened to lightning, the symbol of violence, which rules history, especially in the Kali Yuga; Men above Time are likened to the sun, the symbol of enlightenment; and Men against Time combine both elemental powers, using Dark Age violence to advance Golden Age truths. Savitri Devi devotes the bulk of The Lightning and the Sun to exemplifying her theory with biographies of Genghis Khan, the quintessential Man in Time; the Pharaoh Akhnaton, the paradigm of the Man above Time; and Adolf Hitler, the Man against Time. The Lightning and the Sun is most famous for defending the thesis that Adolf Hitler was an avatar of the Hindu God Vishnu, the sustainer of order. Savitri Devi did not originate this thesis but encountered it widely among educated Hindus in the 1930s. As R. G. Fowler argues in his Editor’s Foreword to this new edition, Savitri Devi’s goal was to create a new National Socialist religion. She aspired to be the Saint Paul to Hitler’s Jesus. Paul of Tarsus took Jesus, who was a religious prophet and a failed political revolutionary, and turned him into a divine incarnation, creating a religion which served as the vehicle for the triumph of Jewish values over Rome. Savitri Devi sought to transform Adolf Hitler, who was also both a prophetic figure and a failed political revolutionary, into a divine incarnation, hoping to create a religion that would serve as the vehicle for the triumph of National Socialism over egalitarian modernity. In spite of its near-legendary status, The Lightning and the Sun is a notoriously hard to find book. The first edition consisted of only 1,000 copies and is quite rare. The 1979 Samisdat reprint is long out of print and also quite rare. The most readily available edition is William Pierce’s dramatically abridged version, which cuts two thirds of the text and was not authorized or checked by Savitri Devi. The Savitri Devi Archive’s new edition of The Lightning and the Sun reprints the complete and unabridged first edition and corrects its many typographical errors. It also updates the citations, adds a number of explanatory notes, includes a helpful Editor’s Foreword, and provides a detailed index. With this new edition, which is edited and manufactured to the highest academic press standards, The Lightning and the Sun has finally found a worthy embodiment.